September 18, 2017 As the Saskatoon Solar Power Demonstration Site approaches its one year anniversary, it has more than 42,000 kilowatt hours of environmentally responsible energy to show for itself and three prestigious awards including the Regional Centre of Expertise on Education for Sustainable Development, the Rob Dumont Energy Management Award for 2016 Project of the Year, and the Canadian Electricity Association’s Leadership in External Collaboration and Partnerships. August 15, 2017 Solar Partnerships: Generating Green Energy Solutions. "Saskatoon gets about 2,300 hours a year of sunlight, among the best in Canada...It's a major renewable resource. In Saskatoon making kilowatts from the sun is something we can really excel in." see Saskatoon Home Magazine pages 69-74 click on Solar Partnerships in table of contents to view the article. July 13, 2017 The Natural Choice for Solar in Saskatchewan There is one resource in particular of which Saskatchewan has no shortage, and a Saskatoon-based co-operative is taking advantage. The Saskatchewan Environmental Society (SES) Solar Co-operative has been working to convert the 2,267 hours of sunshine Saskatoon gets each year into a usable power source. Since it started in 2014 the co-op has built three solar panel installations in the city. 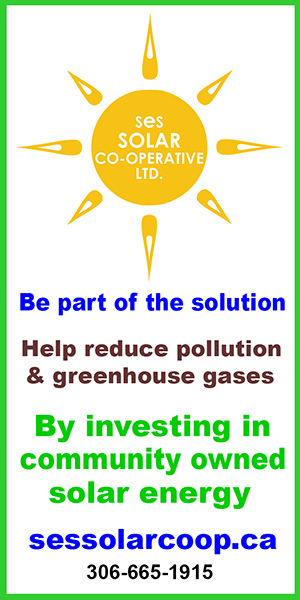 See Co-operatives First Monthly Newsletter for the full story. March 11, 2017 Bill Wardell takes the sunshine express to work. Wardell, Adviser to the SES Solar Co-op, is among a small but growing number of converts in the Saskatoon region to embrace electric vehicles, and he powers his with energy from his own solar array. Bill says he is "driving on pure sunshine"
January 18, 2017 Walking the talk: Putting the sun to work on Canada's Prairies. Solar energy for powering electric vechicles. Lynn Oliphant & Rhonda Shewfelt, interview with Steve Kux , Policy Analyst with the David Suzuki Foundation. October 15, 2016 Bright Idea: Saskatchewan's first solar co-operative A Saskatoon co-operative has flipped the switch on Saskatchewan's first solar power co-operative...the brainchild of the Saskatchewan Environmental Society. The Saskatchewan Environmental Society Solar Co-operative has reached an agreement with Saskatoon Light and Power to power a methane gas plant at the Saskatoon landfill. SES Director of Environmental Policy Peter Prebble gave an update on the SES Solar Co-operative Ltd.
SES Director of Environmental Policy Peter Prebble talked about the SES Solar Power Coop. SES Director of Environmental Policy Peter Prebble talked about the Affinity Credit Union Business for Good solar power co-op. SES board member Joe Schmutz talked about the City of Saskatoon’s proposed solar power pilot project. SES Office Manager Megan Van Buskirk talked about SES’s chance to win $50,000 in the Affinity Credit Union Business for Good Social Venture Challenge. SES short-listed for the Affinity Credit Union Business for Good Social Venture Challenge and has a chance to win $50,000.